In October 2018, the Urban Policy Lab partnered with Vox Pop Labs and the Canadian Broadcasting Corporation to enhance the Toronto municipal election edition of Vote Compass, an award-winning application that informs voters on how their views align with those of the candidates running for election. Utilizing data from the Council Scorecard, Vote Compass users can now learn not only what mayoral and council candidates promise to do if elected, but also how these promises compare to the actual voting records of council incumbents. 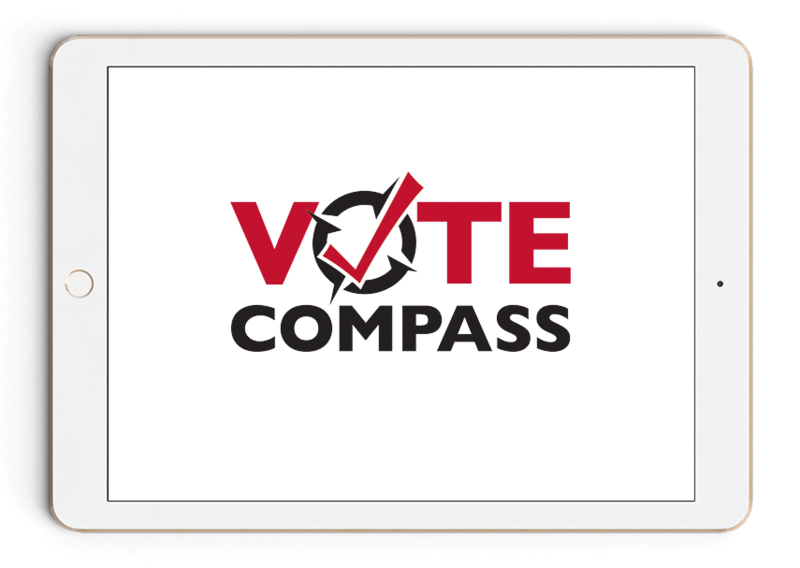 Vote Compass works by asking users a series of questions relevant to the election campaign, and determining how closely aligned users' answers are to the positions expressed by candidates for election. The Council Scorecard improves the accuracy of Vote Compass data by corroborating the public statements of council incumbents against their public voting records, thereby providing voters an additional source of information to judge the performance of their current elected representative. Click here for a detailed description of Vote Compass methodology. The Vote Compass questionnaire includes 30 questions on various policy issues relevant to the 2018 Toronto municipal election. Researchers at the Urban Policy Lab matched these questions with similar motions debated and voted on by City Council during the 2014-2018 term. Click on a Vote Compass question below to see matching council items and vote results for all incumbents (34 councillors plus the mayor) seeking re-election. Click the item number to view complete voting records provided by the City of Toronto. Question 1. Toronto city service providers should report people who entered Canada unlawfully to federal authorities. Summary: Following the election and inauguration of United States president Donald Trump, Toronto Council voted on a motion brought forward by Mayor John Tory to reaffirm Toronto’s status as a Sanctuary City. A Sanctuary City is a city in which municipal employees do not check for citizenship status when people access services like recreation programs. Toronto council first voted to declare the city a Sanctuary City in 2013. Tory’s motion was separated into five recommendations, with the first recommendation being voted on separately. 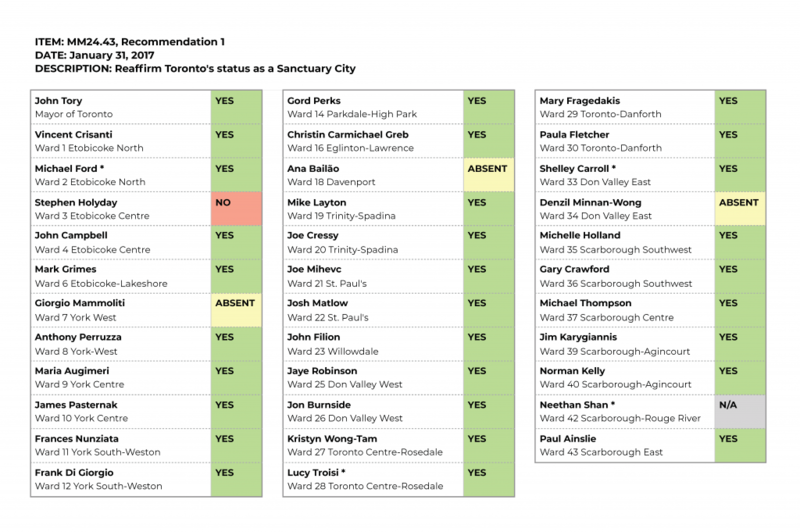 That vote — which reaffirmed “Toronto as a Sanctuary City where all residents have full rights to access all city services and city-administered services without fear, regardless of their documentation status” -- is the one referenced here. Question 2. Permanent residents who do not have Canadian citizenship should be eligible to vote in Toronto elections. Summary: There were no votes during the 2014-2018 term of City Council on the question of extending the franchise to permanent residents. Question 3. How much influence should unions have in Toronto politics? Summary: Toronto council created Canada’s first-ever municipal lobbyist registrar in 2007, requiring anyone paid to meet with people at city hall to advocate on issues to register and report on their communications with councillors, the mayor and staff. When the lobbyist registrar was created, the city’s unions were given an exemption for communications related to labour contracts with the city, and communication related to health and safety. 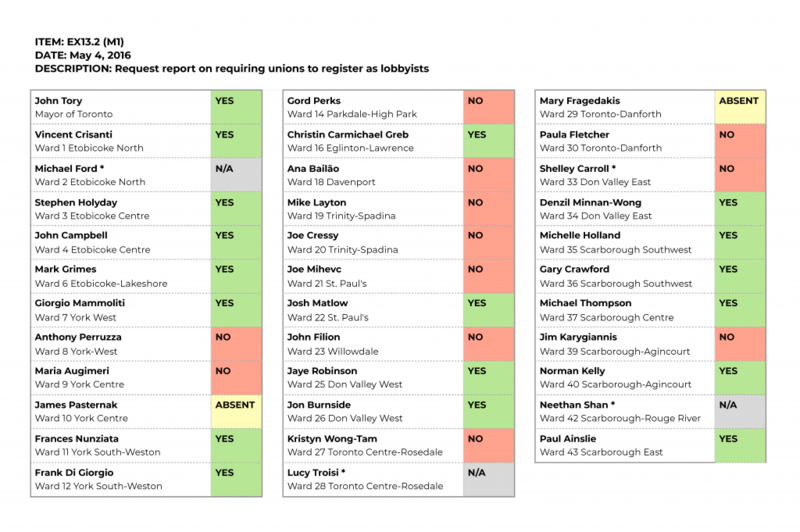 When the lobbying by-law came before Mayor John Tory’s executive committee for review in 2016, Deputy Mayor Denzil Minnan-Wong successfully moved a committee motion to request a report on possibly removing the union exemption. That motion was strongly opposed by the city’s organized labour organizations, who saw it as an attempt to limit their influence. 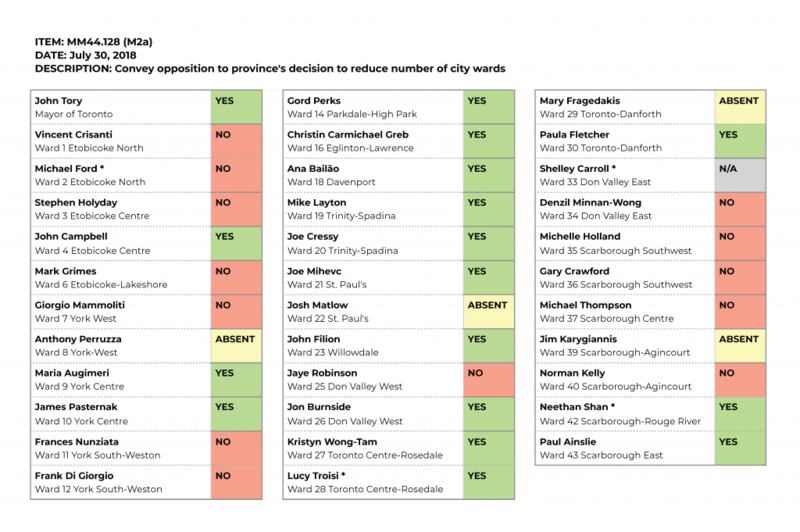 When the item came before council for approval, Councillor Mike Layton moved to delete Minnan-Wong’s recommendation. His attempt was defeated, 25-16. That vote is reflected here. The lobbyist registrar exemption for organized labour union remains in effect. The issue may come before councillors again next term. Question 4. How much should the City of Toronto do to address climate change? Summary: In 2015, Toronto council overwhelmingly supported the creation of a program designed to mitigate the effects of climate change. The program, later dubbed TransformTO, takes a multi-pronged approach, with a range of measures designed to harden infrastructure against extreme weather events, to reduce the city’s overall carbon footprint and to encourage Toronto residents to lower their personal carbon footprint. While most members of council were supportive of these aims in principle, councillors were more divided when it came to funding the program through the city’s budget process. 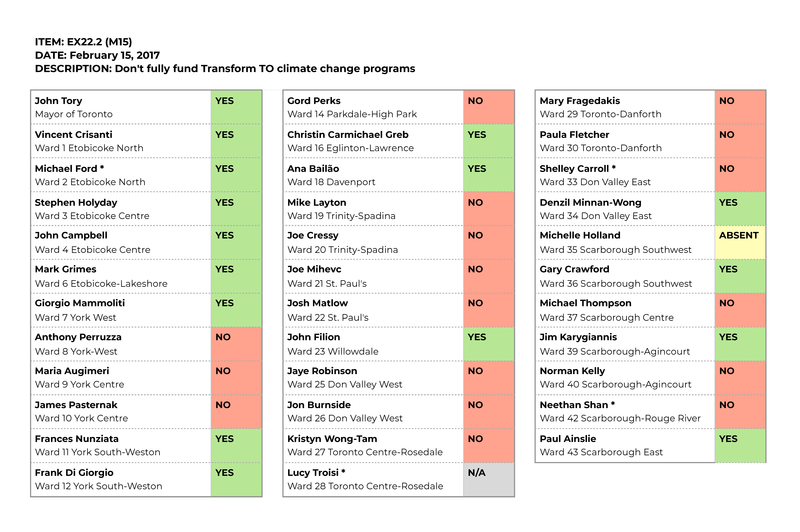 During council’s 2017 debate, Councillor Gord Perks moved to add $1.22 million to TransformTO programs, which would have fully funded all measures. His motion was defeated 23-21. That vote is reflected here. A year later, Mayor John Tory and a majority of council did vote to fully fund the TransformTO program through the 2018 budget. Summary: Climate change has been linked to more frequent and intense storms, which in turn causes flooding. To mitigate against this, in 2017 staff proposed that Toronto consider a stormwater charge. A stormwater charge would levy a fee against property owners whose properties contain large, impermeable surfaces like parking lots. These types of surfaces make flooding worse by pooling water rather than absorbing it. The stormwater charge was designed to be revenue neutral for the city. The City of Mississauga implemented a stormwater charge in 2016 and has seen early indicators that the charge is effective at motivating property owners to make impermeable surfaces permeable. The staff recommendation to pursue further studies on a stormwater charge in Toronto was opposed by some councillors who saw it as a tax grab. 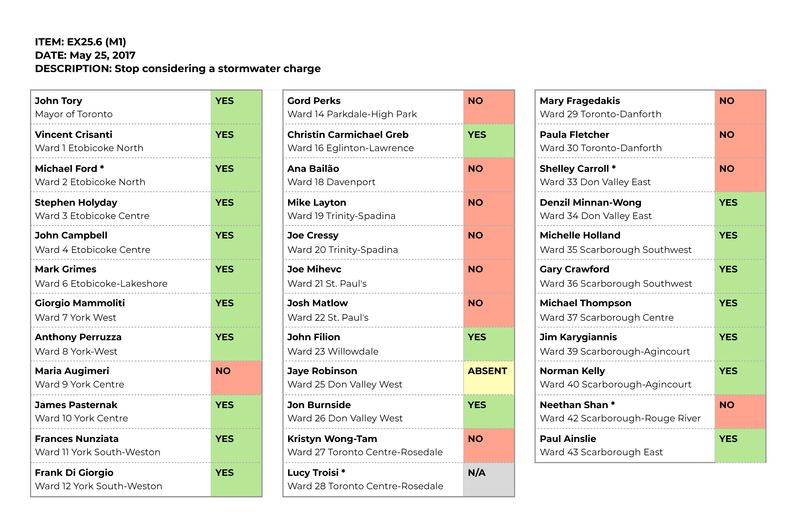 When the report came before Mayor John Tory’s executive committee, Tory successfully moved a committee motion to delete the recommendation to further study a stormwater charge. When the item came before council for final approval, Councillor Janet Davis moved to reverse Tory’s decision and pursue the charge. Her motion was defeated, 26-17. That vote is reflected here. Question 5. How much should the City of Toronto spend to make repairs to city-owned social housing? 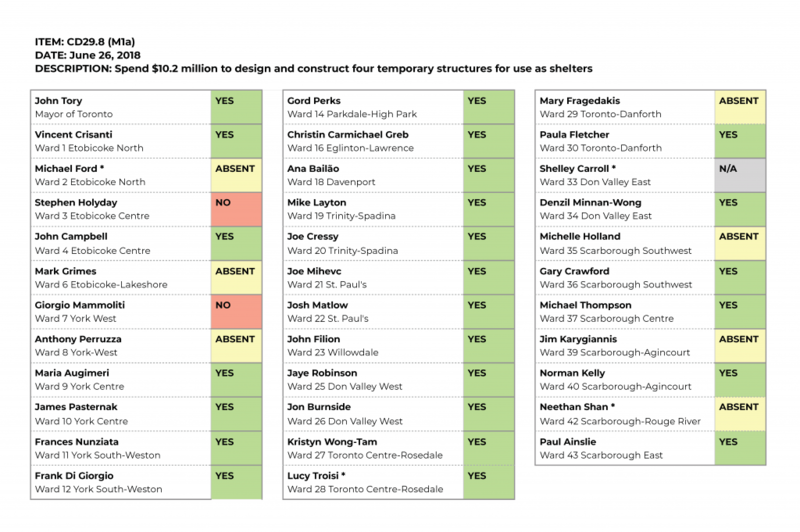 Summary: Midway through each year, Toronto council votes to set a direction for next year’s budget. This direction generally sets expectations for all city departments. For example, a council might vote to set a direction that all departments freeze their operating budgets, or find reductions. In advance of the city’s 2017 budget, responding to a direction from Mayor John Tory to keep residential property taxes at or below the rate of inflation, the budget committee voted to set a budget direction requiring all departments to reduce their operating budgets by 2.6 per cent. 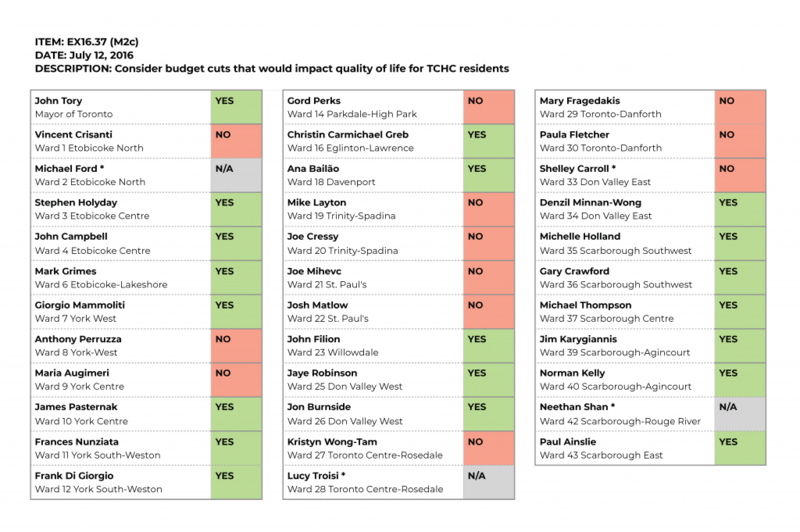 Some councillors worried that this directive would limit the city’s ability to respond to the needs of residents in Toronto Community Housing (TCH), where many units have been identified as needing significant repairs. During the council debate, Motion 2c by Councillor Gord Perks moved that the planned budget reductions should not impact the quality of life for residents in TCH homes. His motion was defeated 25-17. 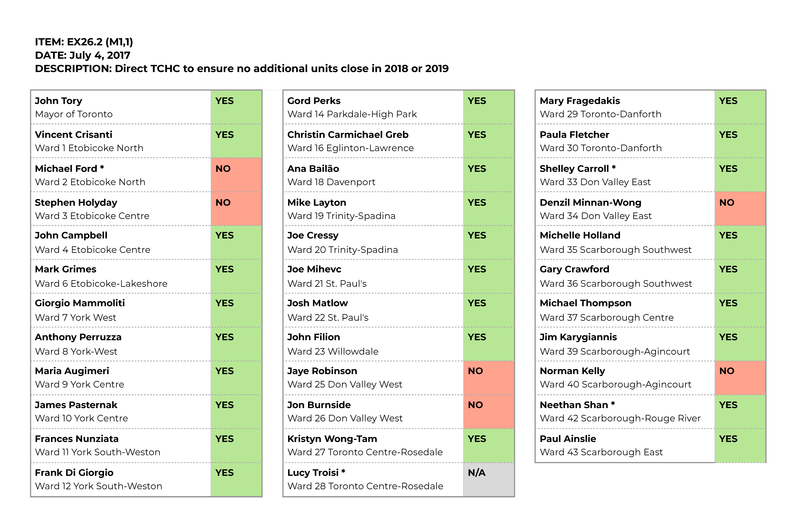 Summary: In 2017, city staff recommended council vote to permanently close 134 units of affordable housing operated by Toronto Community Housing (TCH) on Firgrove Crescent. An assessment of the units found that these units were beyond repair, and that the cost of refurbishing the homes would exceed the value of the homes. Hundreds of residents needed to be relocated. Later that year, council considered a TCH plan dubbed Tenants First. As part of their debate on the plan, Councillor Joe Cressy introduced a motion to direct TCH to ensure no more housing units close in either 2018 or 2019. His motion passed, 36-6. Summary: Midway through each year, Toronto council votes to set a direction for next year’s budget. This direction generally sets expectations for all city departments. For example, a council might vote to set a direction that all departments freeze their operating budgets, or find reductions. In advance of the city’s 2018 budget, the city’s budget committee directed all departments work to freeze their budgets at 2017 levels. Expressing concerned that the budget freeze would not allow Toronto Community Housing and the city’s social services providers to adequately serve those living in city-owned housing or accessing city shelters, Councillor Mike Layton introduced a motion to exempt departments responsible for anti-poverty and housing programs from the planned budget freeze. His motion was defeated, 27-17. Question 6. Toronto should use city-owned land to create new housing units. 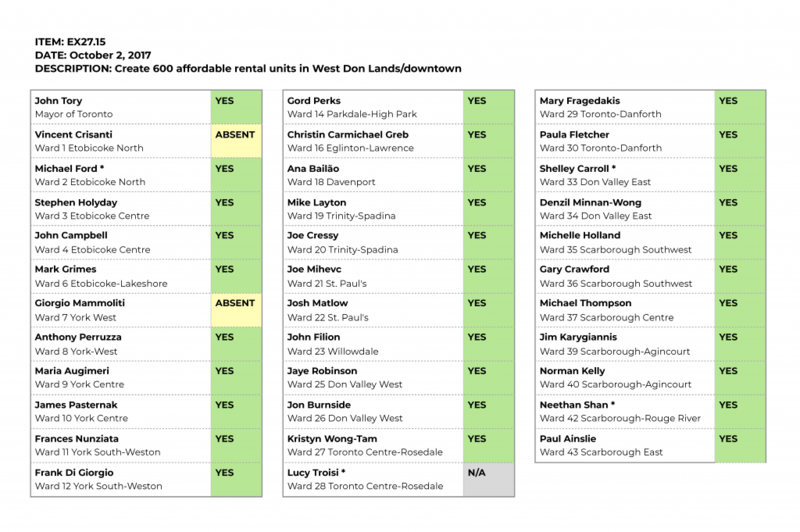 Summary: At their meeting in October 2017, Toronto council considered a report from the Affordable Housing Office recommending approval to create 600 new affordable rental homes. The new housing units were located on land owned by the provincial government, which would be transferred to housing providers. While this vote was not specifically about city-owned land, the vote did reflect a willingness to use public land to create new government-subsidized housing. The item was adopted unanimously, 42-0. Question 7. New condo towers in Toronto should have to include affordable units for low income Torontonians. Summary: “Inclusionary zoning” refers to regulations in which developers constructing residential buildings are required to designate a certain percentage of built housing units as affordable housing for low-income residents. Despite some requests to the province, Toronto has never had the power to use inclusionary zoning as a means toward obtaining more affordable housing units. In December 2017, the provincial government announced that they would introduce new regulations paving the way for inclusionary zoning in Toronto and other municipalities. 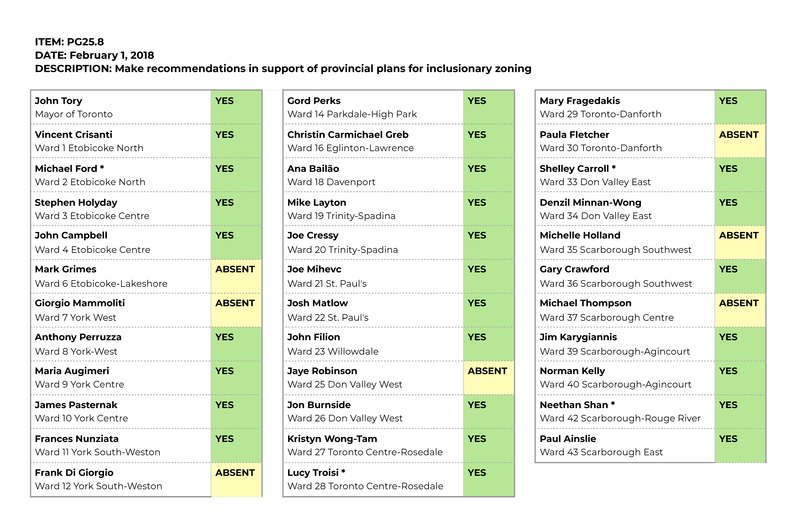 At a meeting in January 2018, Toronto council voted 34-3 to endorse a send a set of recommendations to the province for inclusionary zoning. In doing so, they broadly endorsed the concept. Question 8. There should be more apartment buildings in Toronto neighbourhoods that are currently made up of single-family homes. Summary: There were no votes during the 2014-2018 term of City Council that apply specifically to this question. Question 9. Toronto should build more bike lanes, even if it results in fewer lanes for cars. Summary: In May 2016, council approved a pilot project that would install bike lanes on Bloor Street between Shaw Street and Avenue Road. The purpose of a pilot is to install temporary infrastructure, collect data and report on impacts before permanent infrastructure is installed. In 2017, the city’s Transportation Services department recommended that the Bloor bike lanes become permanent, pointing to an increase in the number of cyclists. Some local business owners opposed the move, saying the removal of parking lanes for automobiles had negatively impacted their business. 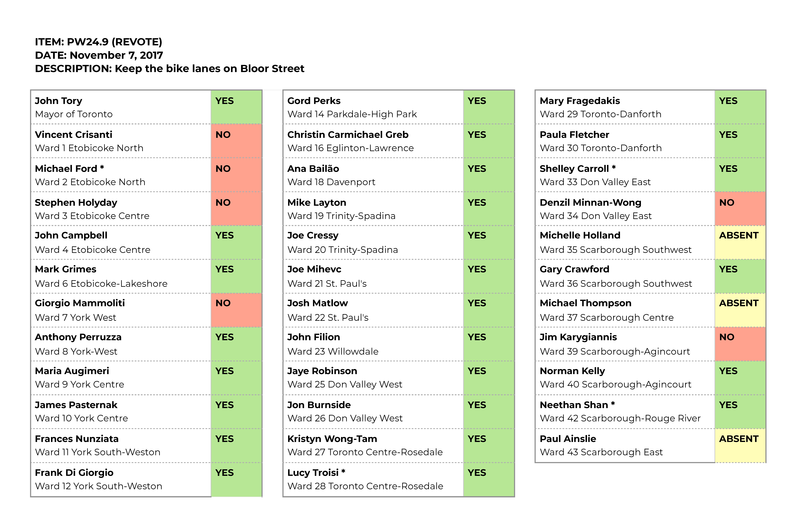 Council voted 36-6 to make the Bloor bike lanes permanent. Summary: In June 2016, Toronto council debated a new plan for bicycle infrastructure, laying out projects over the next ten years. The plan recommended approximately 525 kilometres of new cycling lanes and trails. The report from the city’s Transportation Services department noted that some of the proposed on-street bike lanes would have “some traffic lane impacts”, generally by removing through lanes or turning lanes. Councillor Stephen Holyday moved that any bike lanes with an anticipated impact on traffic lanes be removed from the bike plan. His motion was defeated, 6-34. 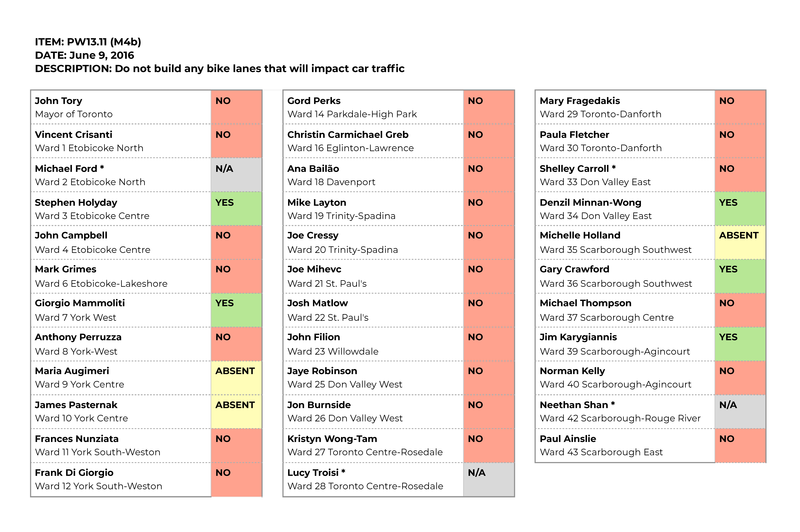 Summary: In June 2016, Toronto council debated a new plan for bicycle infrastructure, laying out projects over the next ten years. The plan recommended approximately 525 kilometres of new cycling lanes and trails. The city’s Transportation Services offered several scenarios for funding the plan. Some scenarios included higher annual levels of funding for new bike infrastructure, which would mean more bike lanes installed faster. The city’s public works and infrastructure committee recommended council approve funding of $16 million a year for the plan. Councillor Mike Layton moved for higher levels of funding, introducing Motion 9 which would increase funding to $25 million per year. His motion was defeated, 24-16. Question 10. Toronto should reduce speed limits on residential streets. Summary: Prior to May 2015, Toronto council had a policy in which speed limits on residential streets could not be lowered to 30 km/h unless traffic calming measures like speed bumps were installed simultaneously with the speed limit reduction. 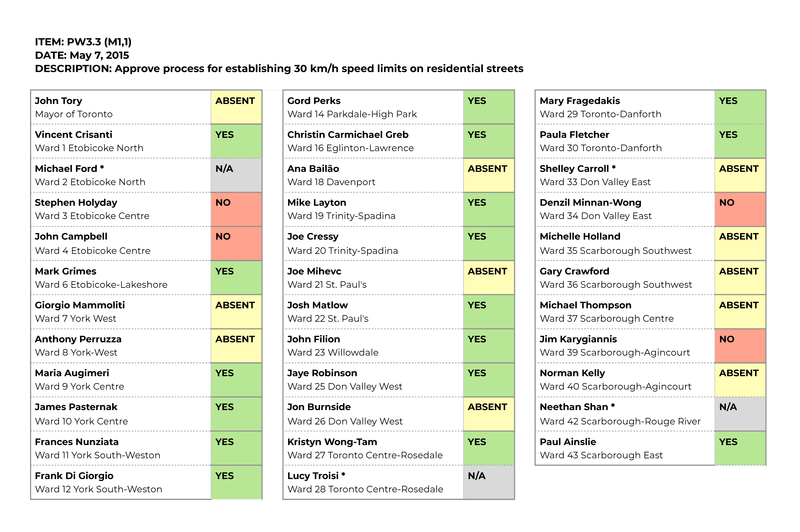 With research suggesting lower speed limits greatly reduce the number of collisions causing death on streets, Toronto councillors requested the city’s Transportation Services department review this policy. City staff responded with a recommendation for a new policy relaxing the requirements for speed limit reductions on residential streets, enabling councillors to more easily lower speed limits to 30 km/h. The city’s public works and infrastructure committee did not initially endorse the staff recommendation, with a vote amongst committee members losing on a 3-3 tie. But when the item went to council for final approval, Councillor Frances Nunziata successfully passed Motion 1, Part 1, which endorsed the staff recommendations. The vote on Nunziata’s motion was 26-5. Question 11. How many officers should Toronto have on its police force? Summary: Following the Danforth shooting on July 22, 2018 where 3 people, including the perpetrator, were killed and 13 wounded, Toronto Council voted over the course of a week on numerous steps to address gun violence. 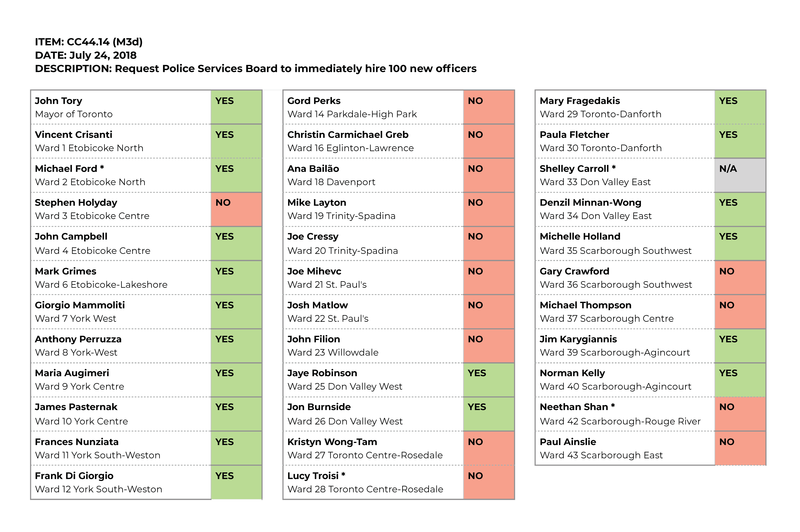 Councilor Mammoliti proposed a motion to request that the Police Services Board immediately hire 100 new police officers. The motion passed narrowly, 24-21. Question 12. Toronto should install more surveillance systems in public spaces. Summary: In the wake of the Toronto Danforth Shooting, City Council debated a series of measures intended to reduce violence across the City. One of the items debated was the implementation of “ShotSpotter” technology. This technology would detect gunshots in real time, theoretically significantly increasing the speed and ability of emergency services to respond to shootings. The technology also comes with concerns about increased surveillance, and its effectiveness is debated based of several US cities which have implemented the technology. 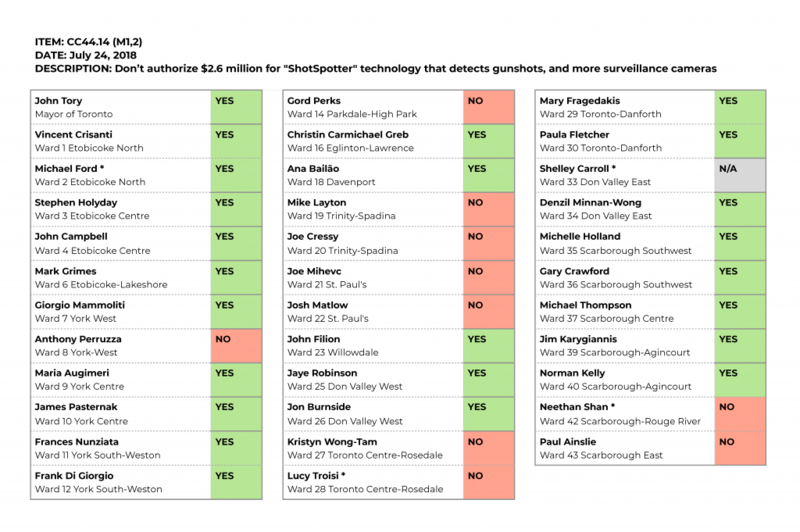 Councillor Josh Matlow raised an amendment to the item, the second part of which was that the City not approve a total of $2.6 million in funding for “ShotSpotter” as well as the provision of more surveillance cameras on city streets. More specifically, this part of the amendment proposed that the City take more time to review the business case for the technology and also consider community and surveillance impacts. The second part of Matlow’s amendment, which is the one referenced here, was voted on separately, and was defeated 12-33. Question 13. Handguns should be banned in Toronto. Summary: Following the Danforth shooting on July 22, 2018 where 3 people, including the perpetrator, were killed and 13 wounded, Toronto Council voted over the course of a week on numerous steps to address gun violence. During the debate, Councillor Joe Cressy introduced a motion relating to a ban on handguns and ammunition. The motion to amend required the City of Toronto to urge the Federal government to ban the sale of handguns in Toronto and to urge the Provincial Government to ban the sale of handgun ammunition in Toronto. The vote on the motion to amend, urging the banning of handgun sales and ammunition is the one referenced here, and passed 41 - 4. Question 14. How many supervised injection sites should Toronto have? Summary: Amidst the opioid crisis which resulted in the deaths of more than 40 people a month across Canada in 2015 and which increased to 64 a month in 2016, Toronto City Council received a report and presentation from the Medical Officer of Health concerning the implementation of safe-injection sites. Safe-injection sites are locations where individuals may inject illicit drugs under supervision with easy access to medical help and addiction counselling, and other social services. 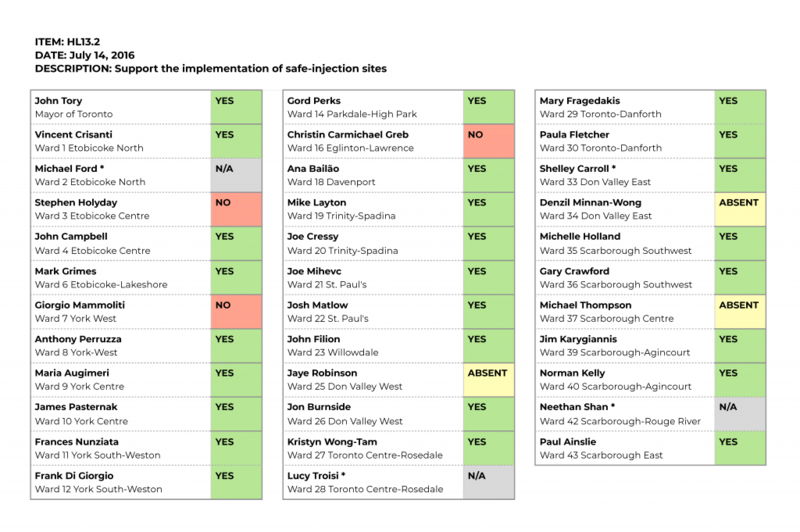 In response to the crisis and the report/presentation from the Medical Officer of Health Toronto Council voted to request the City Manager to provide a letter to the Province, indicating that Toronto Council supported the implementation of three safe-injection sites across Toronto. The item passed without amendment, 36-3. Question 15. 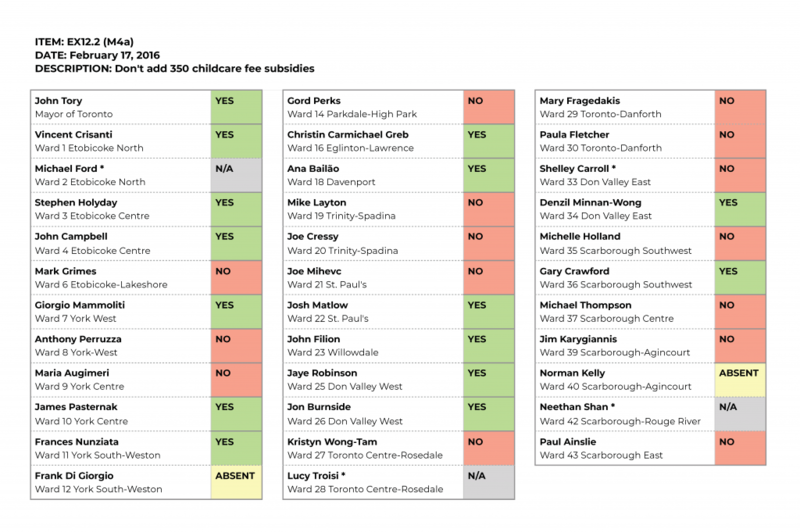 More families in Toronto should receive the city's child care subsidy. Summary: Childcare costs in Toronto have increased rapidly, with a 15% increase between 2014 and 2016 resulting in significant difficulties for lower-income residents to afford the cost of child care. The City of Toronto provides child care fee subsidies in order to assist lower-income families with the cost of licensed child care. However, as a result of the high cost of child care and high demand, there are not enough child care fee subsidies available resulting in a long waitlist. In a vote on Capital and Operating Budget for 2016, Councilor Janet Davis introduced a motion (motion 4a) to amend the Child Services Operating Budget for 2016 to add an additional 350 child care fee subsidies at an initial cost of $2.6 million and an annual cost of $3.5 million. This motion, which is the one referenced here, was defeated, 18-24. Summary: Childcare costs in Toronto have continued to increased rapidly since 2016, averaging over $1,700 a month in 2017, resulting in significant difficulties for all residents, but especially lower-income residents, to afford the cost of child care. The City of Toronto provides child care fee subsidies in order to assist lower-income families with the cost of licensed child care. However, as a result of the high cost of child care and high demand, there are not enough child care fee subsidies available resulting in a long waitlist. At the same time, City of Toronto property taxes which make up the greatest portion of City revenues have been held below the rate of inflation, and held at lower rates than neighbouring municipalities. 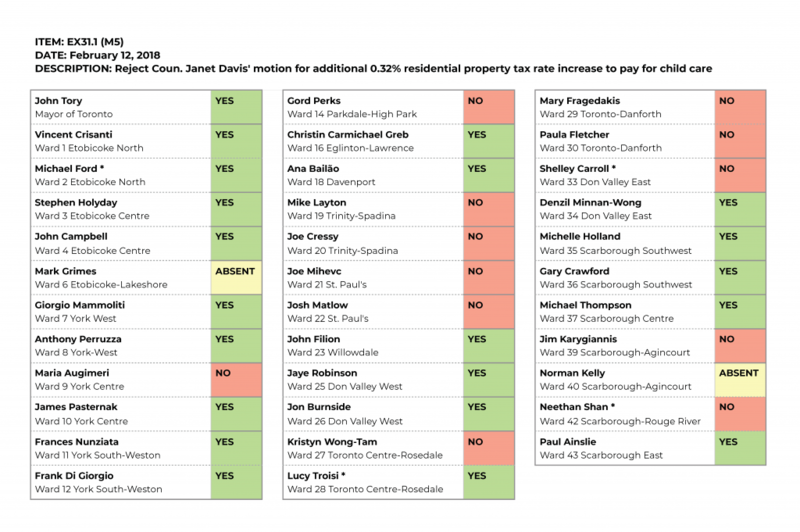 In a vote on property tax rates for 2018, Councillor Janet Davis introduced an amendment (motion 5) to increase residential property taxes by 0.32% in order to, among other things, lower child care fees. This motion, which is the vote referenced here, was defeated, 14-28. Question 16. City Council will function more effectively now that it has fewer councillors. Summary: Following the 2016 provincial election and the installation of Doug Ford as Premier of Ontario, the provincial government introduced a bill to reduce the number of councillors in the City of Toronto. This reduction was announced in the run-up to the 2018 Toronto municipal election which would have seen the number of councilors increase to 47. Instead, the province’s legislation reduced the number of councilors to 25, and based ward boundaries on provincial and federal ridings. The province said that a smaller council would be more effective than a larger one, and would generate cost savings. Toronto Mayor John Tory introduced an urgent motion to respond to the provincial legislation in July of 2018. An amendment to this motion by Councilor Joe Cressey (motion 2a), which is the vote referenced here, asked that “ City Council convey its opposition to the Provincial government's intention to introduce legislation to reduce the size of City Council to 25 Councillors and a Mayor.” The amendment was passed, 24-17, and included as recommendation 1 of the final council decision. Question 17. How much should the City of Toronto spend to accommodate people with disabilities? Description: Do not consider bringing back vehicle tax to pay for AODA requirements, etc. 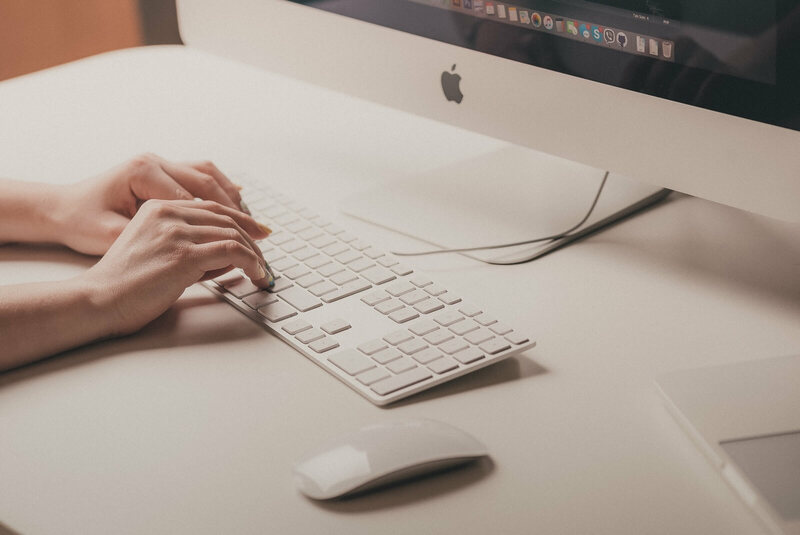 Summary: The Accessibility for Ontarians with Disabilities Act, 2005 requires municipalities to ensure certain standards of accessibility, and introduced deadlines for compliance. For example, Toronto subway stations are supposed to be fully accessible by 2025. Toronto has however faced numerous budget shortfalls in recent years, which has made improving accessibility for people with disabilities more difficult. The city also revoked the Personal Vehicle Registration Tax, a tax which required vehicle owners in Toronto to pay an annual tax upon registering their vehicle, in 2010. 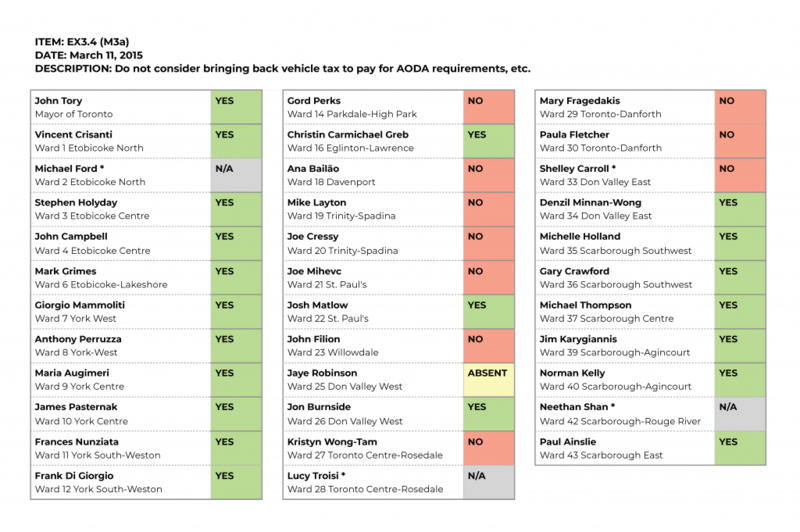 In a vote on 2015 Capital and Operating budgets, Councilor Kristyn Wong-Tam moved for an amendment for a report on bringing back the Personal Vehicle Registration Tax so that Toronto could meet its obligations under the AODA and make subway stations accessible by 2025. This motion to amend, which is being referenced here, was defeated 14-30. Question 18. How many homeless shelter beds should there be in Toronto? Summary: During the very cold winter of 2017-2018, Toronto shelters reported that they were 95% full. Nearly 25% of shelter users that winter were refugees. In order to address the crisis Toronto council voted on the 2018 Shelter Infrastructure Plan and Progress report which included several measures aimed at increasing capacity in city shelters. 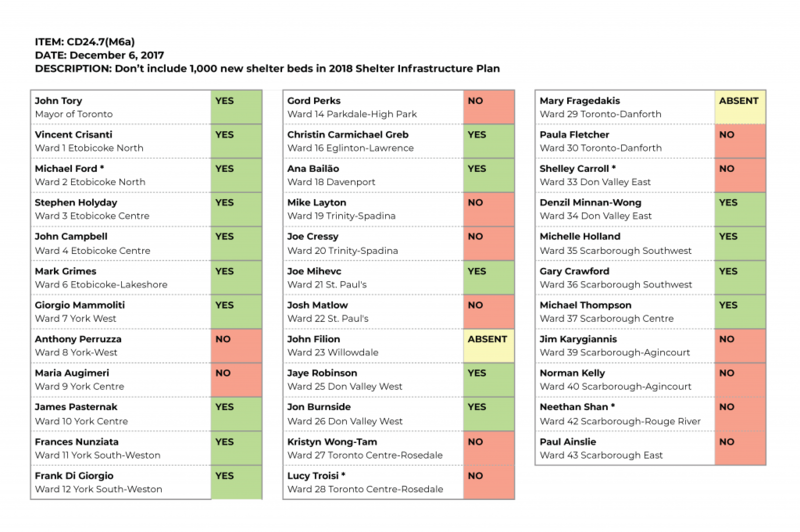 Councillor Kristyn Wong-Tam proposed a motion to amend (Motion 6a) the proposed measures and add an additional 1000 shelter beds to the Shelter Infrastructure Plan in order to put the number of beds in use below the 90% capacity threshold defined by previously-approved council policy. This amendment was defeated 17-25. Summary: The winter of 2017-2018 saw Toronto shelters report themselves as 95% full, well beyond the 90% maximum threshold set by City Council. Shelters were so full that some Federal MPs urged Toronto Council to request the Department of Defence open armouries to the City to be used as emergency shelters. In June 2018 Toronto Council voted on the 2019 Shelter Infrastructure Plan and System Update report which included numerous measures relating to shelters. Mayor John Tory raised a motion to amend the proposed items to increase spending by $10.2 million to design and construct four temporary structures for use as shelters which would help alleviate crowding during the 2018-2019 winter. This amendment, which is the one referred to here, passed 34-2. Question 19. How much should residents of Toronto pay in property tax? Summary: The City of Toronto, like most municipalities across Canada, depends on property taxes as its primary source of revenue. However in recent years Toronto council has often decided to hold down property tax rates at the rate of inflation or lower , limiting city revenue increases and keeping overall property tax payments below that of neighbouring municipalities. In February 2018, Toronto Council voted to set its property tax rates for the upcoming fiscal year. 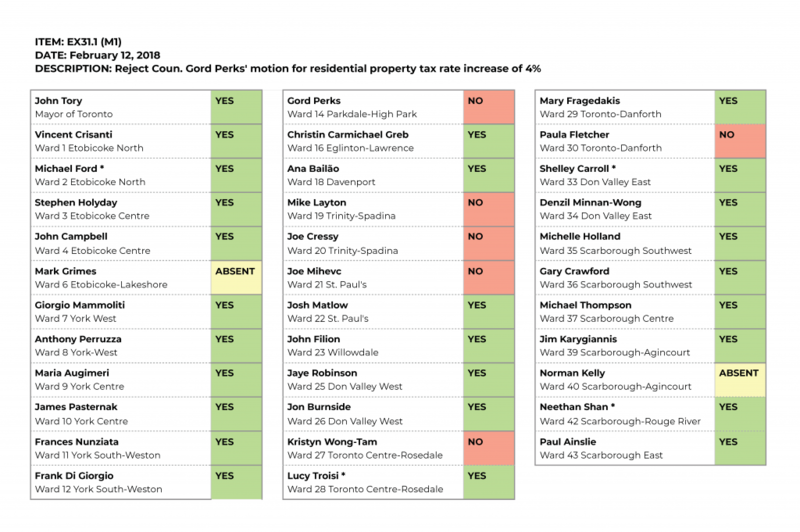 Councillor Gord Perks raised a motion to amend (motion 1) the rates, seeking a residential property tax rate increase of 4% both to raise tax rates closer to GTA norms and to raise more revenue to pay for increased social services. This amendment was defeated 9-33, and then, upon a revote, was defeated again 8-34. Summary: In February 2018, Toronto Council voted to set its property tax rates for the upcoming fiscal year. 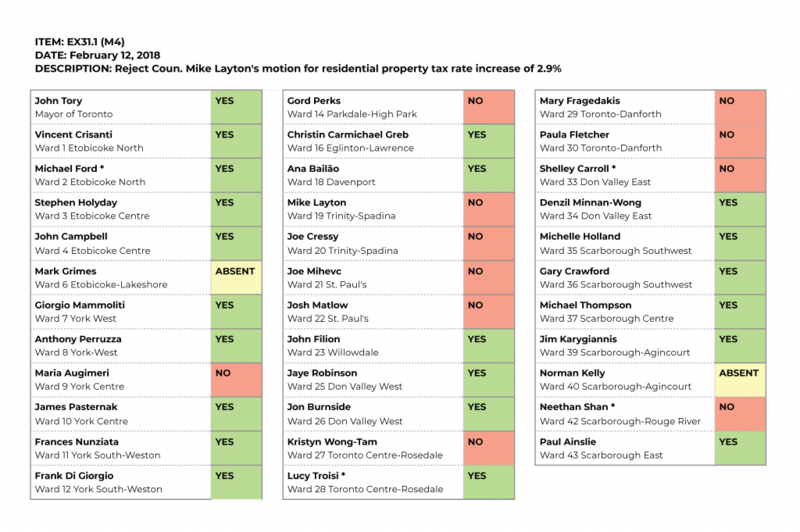 Councillor Mike Layton raised a motion to amend (motion 4) the rates, seeking a residential property tax rate increase of 2.9% both to raise tax rates closer to GTA norms and to raise more revenue to pay for increased social services. This amendment was defeated 13-29. Summary: In February 2018, Toronto Council voted to set its property tax rates for the upcoming fiscal year. Councilor Janet Davis raised a motion to amend (motion 5) the rates, seeking an additional residential property tax rate increase of 0.32% beyond budget committee recommendations in order to reduce social service fees, and specifically to decrease the cost of subsidized child care spaces. This amendment, which is the one referenced here, was defeated 14-28. Question 20. Toronto police officers should be able to march in uniform as part of the Pride Parade. Summary: In 2016 Black Lives Matter Toronto temporarily shut down the annual Toronto Pride parade, and presented a list of demands to Pride leadership. One of them was that Toronto police officers should no longer be allowed to march in the parade in uniform. In a May 2017 vote allocating funding to cultural organizations, Councilor John Campbell made a motion to amend (motion 1) the allocations. His amendment contained two recommendations. The first recommendation was that Toronto Council should only provide its annual funding of $260,000 for Toronto Pride, if police officers were allowed to march openly in uniform. The second recommendation was that all cultural program funding be reviewed to ensure the objective of inclusivity was being met to the City’s standards. This amendment, which is the one referenced here, was defeated 17-27, and the City of Toronto provided the funding of $260,000 to Pride Toronto with no conditions. Question 21. How much should the City of Toronto do to further reconciliation with Indigenous Peoples? Summary: In July 2017, the City of Toronto asked the Toronto Aboriginal Support Services Council to identify ways the city could better serve Indigenous Peoples. 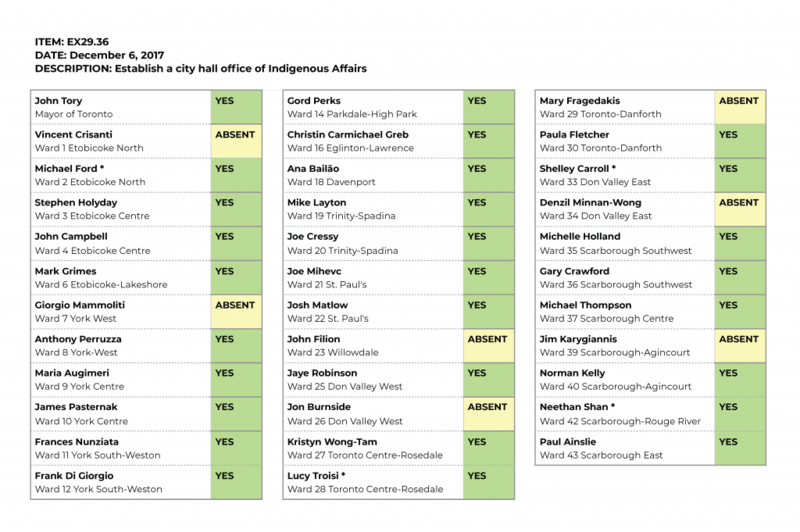 The Council found that there is a low level of trust between Indigenous Peoples and the city and a perception that Indigenous Peoples have a low level of urgency within the municipal government. To address this, city staff recommended the creation of an Indigenous Affairs Office. Operating out of the City Manager’s Office, the Indigenous Affairs Office will develop and implement a reconciliation strategy. Five staff positions were included in the recommendation. Toronto Council supported the creation of the office 38-0. 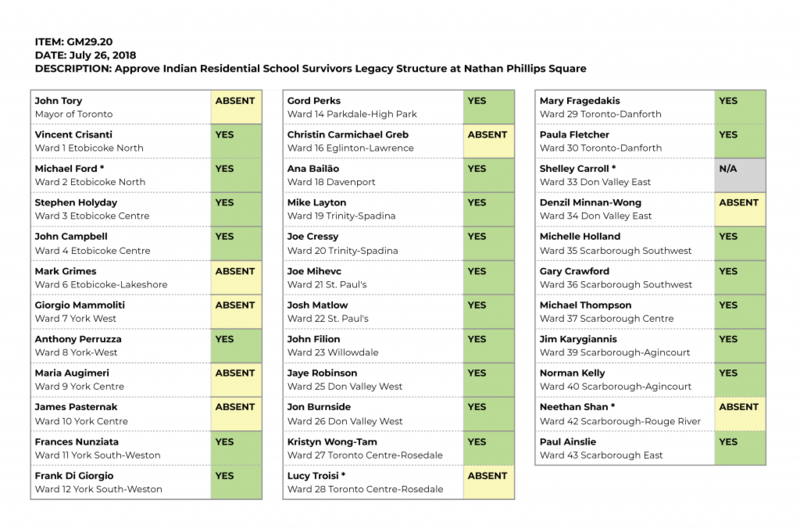 Summary: In their landmark report, Canada’s Truth and Reconciliation Commission issued a call to action to governments to build “a highly-visible, publicly accessible residential schools monument in each capital city to commemorate the victims and survivors of Canada’s residential schools.” In July 2018, city staff asked Toronto council to approve $250,000 in preliminary project funding for a landscaped garden in Nathan Phillips Square outside Toronto city hall. The garden will include a centrepiece Restoration of Identity sculpture by artist Solomon King. Council voted 35-0 to approve the plan. Question 22. City Hall should cut public services to reduce spending. 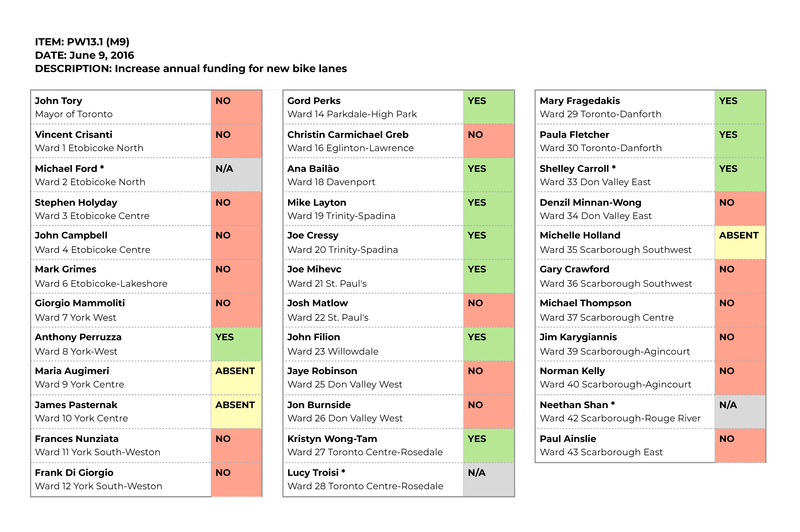 Summary: Midway through each year, Toronto council votes to set a direction for the next year’s budget. The direction may ask departments to freeze or cut their budgets, or look at adding new or enhanced services. In July 2016, the budget committee recommended Toronto Council approve a budget direction asking all departments cut 2.6 per cent from operating expenses. 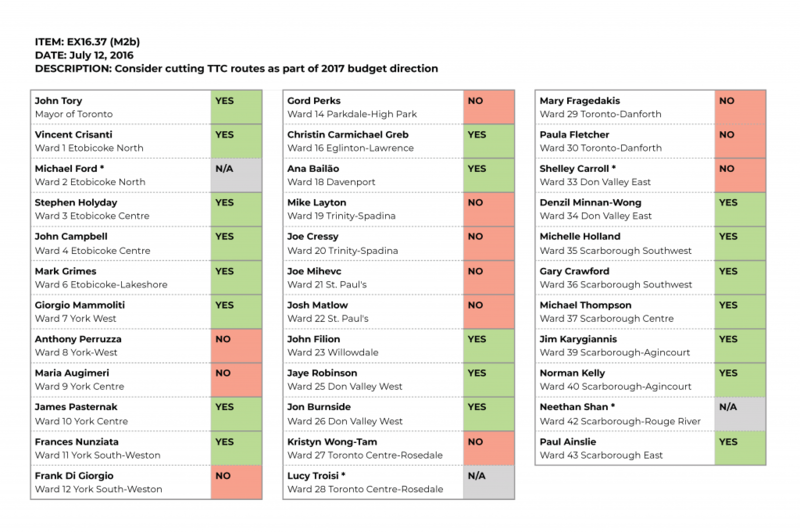 Concerned that this direction would mean cuts to transit service, Councillor Gord Perks introduced a motion that would request the TTC make no cuts to bus, streetcar, Scarborough Rapid Transit and subway routes. The motion (Motion 2b) was unsuccessful, losing 25-17. Summary: Council’s 2017 budget direction asked departments to find savings. To achieve this, the city’s Shelter, Support and Housing Administration department submitted a budget that would reduce the number of staff members working in frontline shelter positions. The budget proposed eliminating 10.3 positions. Expressing concern that eliminating these positions would have a negative impact on city shelters, which have struggled with providing enough capacity to serve people in need. 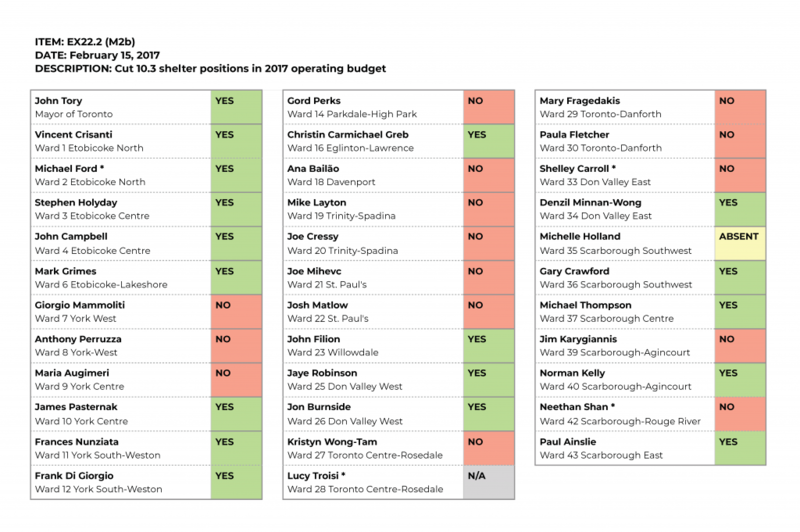 Seeking to reverse the cut at council’s budget debate, Councillor Joe Cressy introduced a motion that would restore funds for the 10.3 shelter positions. Council voted against his motion, 25-19. Question 23. Police should be able to stop and collect information about anyone they consider suspicious, even if no particular offence is being investigated. Summary: There were no votes during the 2014-2018 term of City Council on the question of "carding." Question 24. How much should the City do to help new immigrants adapt to life in Toronto? Summary: In April 2018, Toronto council considered a report on a new agreement between the governments of Canada, Ontario and Toronto affecting matters on immigration and settlement. 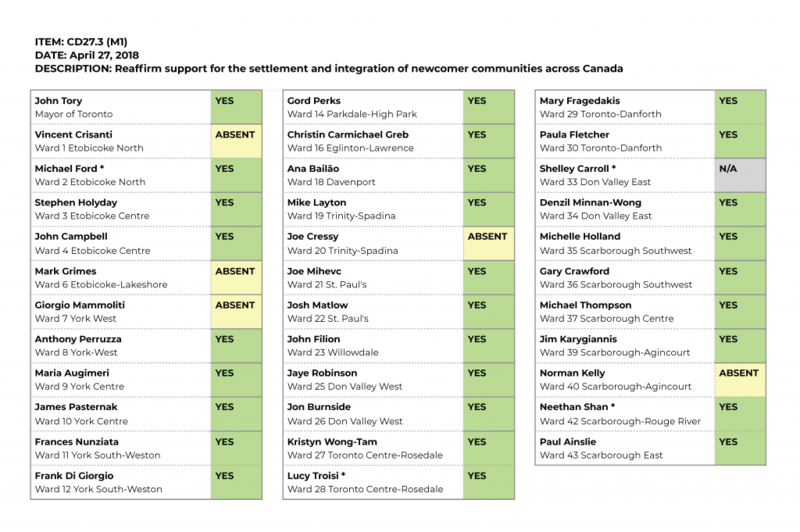 As part of their debate on this agreement, Mayor John Tory introduced a motion (Motion 1) that, in addition to requesting additional funding and support from provincial and federal governments to better handle an increase in refugee arrivals, also asked council to “reaffirm its support for the settlement and integration of newcomer communities across Canada, and Toronto’s leadership as a welcoming and inclusive City for all.” Tory’s motion carried 36-0. 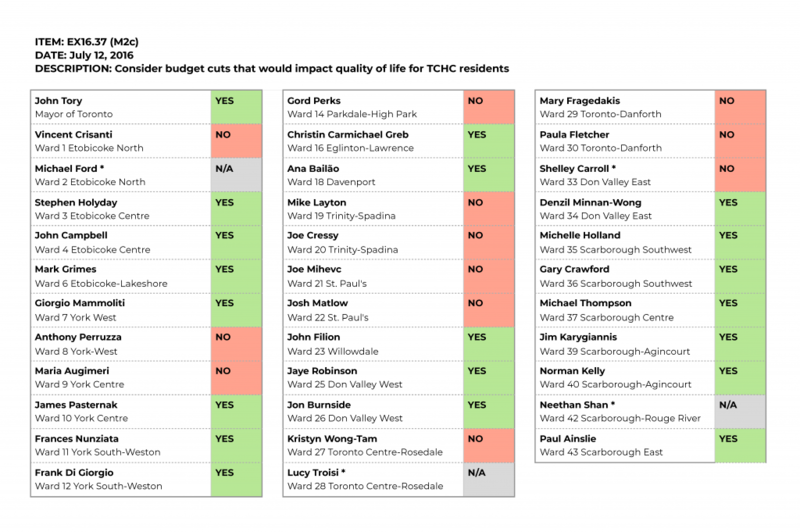 Summary: During Toronto council’s debate on the 2017 budget, Councillor Joe Mihevc introduced a motion to add one new full-time position to the city’s Newcomer Office. The Newcomer Office works with new immigrants and refugees arriving in Toronto, providing support in accessing housing, employment and other services. Mihevc’s motion was in response to increased demands on the Newcomer Office stemming from an increase in refugee arrivals. Adding the position would increase the city’s budget by $137,000. Mihevc’s motion (Motion 19c) was approved, 24-20. Question 25. The eastern section of the Gardiner Expressway should be replaced with a boulevard. Summary: The eastern section of the Gardiner Expressway between Jarvis Street and the Don Valley Parkway is in a state of advanced disrepair. In 2015, Toronto council was asked by staff to decide whether to maintain this section of expressway or remove it. A study concluded that removing the expressway and replacing it with a boulevard would cost about $500 million less than maintaining it. But replacing the expressway would have some impact on travel times for those travelling via automobile. During the June 2015 meeting of Toronto council, Mayor John Tory introduced a motion calling for councillors to endorse a “hybrid” option for this part of the Gardiner. The “hybrid” would maintain the expressway with some modifications to create more room for waterfront development. Though he faced opposition from some councillors concerned about the costs, Tory’s motion (M1c, Part 1) passed, 24-21. Question 26. City officials should be able to evict people from social housing if they are convicted of a serious crime. Summary: Currently, the provincial Housing Services Act allows tenants evicted from Toronto Community Housing (TCH) buildings for criminal activity to immediately re-apply for housing through TCH. In April 2017, Mayor John Tory sought Toronto council’s support to change this. He brought forward an item requesting that the province enact legislation allowing housing providers discretion to refuse to rehouse tenants who have been evicted for criminal behaviour. The item passed with no opposition from councillors in attendance, 40-0. Question 27. 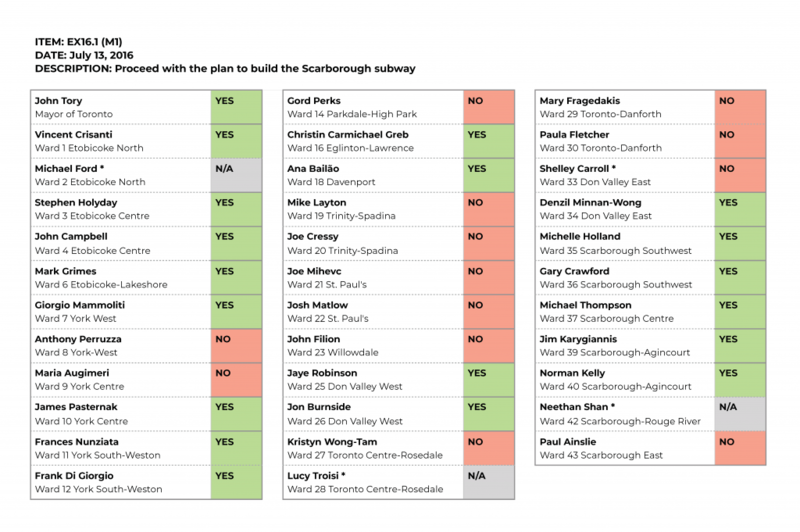 How much should the City of Toronto contribute towards building the Scarborough subway? Summary: Toronto’s Auditor General conducts regular investigations into various city departments and agencies, examining spending and looking for waste or irregularities. In 2013, Toronto council voted to approve a plan for an extension of the Bloor-Danforth subway line to Scarborough Town Centre. This replaced a previously-approved plan to build a seven-stop light rail transit (LRT) line in Scarborough. The Scarborough subway plan has been controversial in the years since. As it was initially approved before substantial design work was complete, costs and detailed ridership estimates were not readily available. In 2017, after some modifications were made to the Scarborough Subway plan and after the release of new information about potential costs and ridership, Councillor Josh Matlow introduced a motion to ask the Auditor General to conduct a value-for-money audit comparing the cost-benefit of the Scarborough Subway and the Scarborough LRT. Matlow’s motion (Motion 1) was defeated 27-13. Summary: In 2013, Toronto council voted to approve a plan for an extension of the Bloor-Danforth subway line to Scarborough Town Centre. This replaced a previously-approved plan to build a seven-stop light rail transit (LRT) line in Scarborough. The Scarborough subway plan has been controversial in the years since. As it was initially approved before substantial design work was complete, costs and detailed ridership estimates were not readily available. In 2016, after modifications were made to the plan, the Scarborough Subway project again came before council for approval. Councillors were asked to approve the hiring of consultants to conduct further design work. Councillor Josh Matlow introduced a motion to halt this process, calling instead for a return to the previously-approved LRT plan. His motion (Motion 1) to bring back the LRT was defeated 27-16. Question 28. Toronto should build more stations on GO Transit lines rather than build more light rail transit (LRT) lines. Summary: During his mayoral campaign in 2014, John Tory proposed a transit plan he called “SmartTrack.” SmartTrack promised to add local subway-style transit service on existing GO Transit rail lines. Tory promised 22 stations open by 2021. When Tory was elected, SmartTrack became a priority transit project for the city. The plan had changed by 2018. At their April meeting, Toronto council was asked to approve up to $1.195 billion in funds to fund the construction of six new stations on GO Transit lines to provide more transit service. Some councillors argued this cost should have been borne by the provincial government. 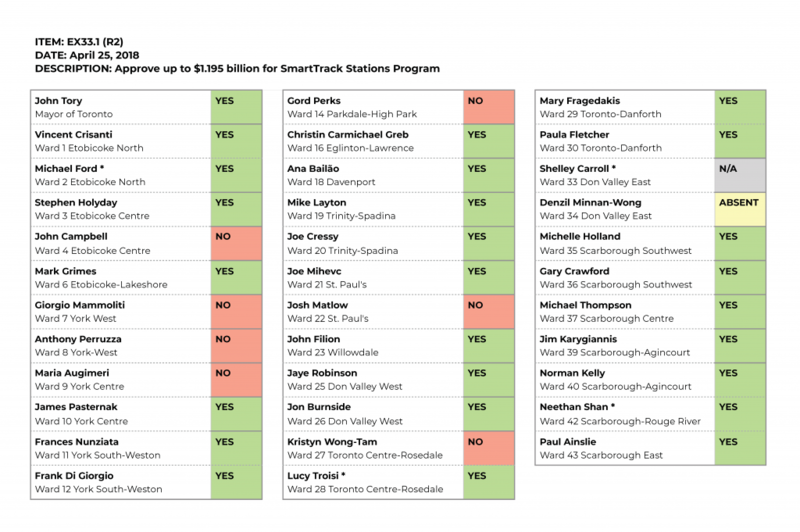 Council voted 35-8 in favour of Recommendation 2 in the report, which approved the funds for the new stations. Question 29. The Sheppard subway line should be extended further into Scarborough. Summary: In July 2016, Toronto council considered a report laying out the city’s Transit Network Plan through the year 2031. The report gave councillors an opportunity to debate a variety of potential transit projects across the city. One such transit project was a possible extension of the subway line on Sheppard Avenue. A previously-approved plan called for a light rail transit (LRT) line to be built on Sheppard, but some councillors believed an extension of the subway would be preferable. Opponents argued that the Sheppard subway does not currently have enough daily ridership to justify the cost of expansion. During this debate, Councillor Jim Karygiannis introduced a motion (Motion 9) calling for a study of a Sheppard subway extension. His motion carried 25-18. Question 30. The Scarborough subway line should be replaced with a light rail transit (LRT) line.